With a full moon as your chaperone choose from 100km and 68km distances along this magnificent part of the Wild Atlantic Way. Killary Gaelforce bring you The Night Rider Sportif, the cycle sportif with a twist! All the joys of two wheels under the magic lights of a full moon. The idea was the brain child of our resident cycling maniac Shane Young. Shane loves to get out on the bike but in the off season it is harder and harder to get daylight to cycle in so the Night time was his only option. The peace and tranquillity of a Connemara night was something he felt everyone should have the opportunity to experience and so the Night Rider Sportif was born. 2016 was the first year of this event and it proved hugely popular among cycling enthusiasts so this year we are bringing it back! 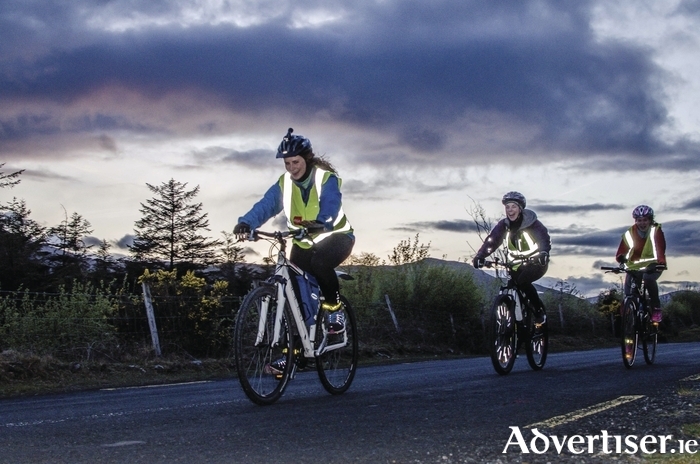 The year’s event, in partnership with John West, will start and finish in the quaint Connemara Town of Clifden. There are 2 distances to choose from in the Night Rider Sportif, 100km or 68km, depending on you fitness level and sense of adventure. Remember it’s not a race! A sportive is a non-competitive cycling event. You will take in the stunning scenery along the Sky Road, the seaside villages of Cleggan and Tully Cross, the breath taking beauty of the moonlight on the Atlantic Ocean and the Killary Fjord then back through the sleepy Inagh Valley.